We have a range of secondary guarding options available for MEWPs in our hire fleet. From sensors, that when activated, stop all functions in use at the time, to systems that alert the operator to potential crushing, our secondary guarding systems are all manufactured with the operator's safety in mind. Developed by AFI, SanctuaryZone is a Tier 1 device which prevents an operator from being crushed when working at height, rather than reacting to the crushing once it has happened. SanctuaryZone comprises of steel frames that project above the machine platform, stopping any overhead obstruction from crushing the operator. 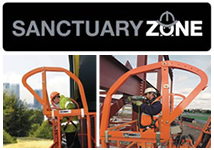 SanctuaryZone can be fitted to all manufacturers’ machines, is fully adjustable and CE approved. The SkyGuard sensor from JLG, when activated by approximately 50lb (23kg) of force, stops all functions in use at the time. After stopping the machine, the control system automatically accesses the functions in use by the operator at the time of activation and, for a short period of time, is able to reverse that sequence, with the exception of certain functions. SkyGuard can be activated from a variety of angles and provides additional protection without impeding or reducing the work envelope of the boom lift. The Genie Operator Protective Alarm (OPA) can be retrofitted to any Genie articulating or telescopic boom lift manufactured after 2002. The system is designed to be as unobtrusive as possible and features a pressure sensitive horizontal bar that is fitted at waist height below the control panel. When pressure is placed on the bar, the system is activated. There is a reset button that can be pressed if the system is inadvertently activated. The SGE from Skyjack features a sensor bar that, when pushed, instantly stops all machine functions and initiates a siren and high intensity flashing beacon. If the bar is released within a second, the siren and beacon will cease, and the selected function will return. If pressure is applied for more than a second, they will continue to operate and the engine will stop, halting all functions until the machine is reset. The SiOPS (sustained involuntary operation prevention system) from Niftylift helps to prevent sustained involuntary operation of the controls on boom lifts when the operator is crushed between an overhead obstacle and the machine’s active controls. The SiOPS control panel is equipped to detect any significant load on the platform’s controls or console – if a load is detected the machine will shut down, with the foot pedal and enable button deactivated. This gives the operator time to consider their position and then operate an override switch and operate the machine in a safe direction to free themself or move out of danger. If for any reason the operator is unable to do this themself the machine’s lower controls can be used by those on the ground to lower the operator to safety.